It is common for people with thyroid cancer to have few or no symptoms. Thyroid cancers are often diagnosed by routine examination of the neck or are unintentionally found by x-rays or other imaging scans that were performed for other reasons. Doctors use diagnostic tests to find out the cancer’s stage, so staging may not be complete until all of the tests are finished. Knowing the stage helps the doctor to decide what kind of treatment is best and can help predict a patient's prognosis. There are different stage descriptions for different types of cancer. The results are combined to determine the stage of cancer for each person. For thyroid cancer, there are 5 stages: stage 0 (zero) and stages I through IV (1 through 4). The stage provides a common way of describing the cancer, so doctors can work together to plan the best treatments. In addition to the TNM system, papillary and follicular thyroid cancers are also staged based on the age of the patient. Using the TNM system, the letter “T” plus a letter or number (0 to 4) is used to describe the size and location of the tumor. Some stages are also divided into smaller groups that help describe the tumor in even more detail. When describing “T” in thyroid cancer, doctors may subdivide the general categories by adding the letter “s” to indicate a solitary (single) tumor or “m” to indicate multifocal (more than 1) tumors. Specific tumor stage information is listed below. T0 (T plus zero): There is no evidence of a tumor. T1: The tumor is 2 centimeters (cm) or smaller and limited to the thyroid. T1a: The tumor is 1 cm or smaller. T1b: The tumor is larger than 1 cm but less than 2 cm. T2: The tumor is larger than 2 cm but smaller than 4 cm and is limited to the thyroid. T3: The tumor is larger than 4 cm, but the tumor does not extend beyond the thyroid gland. T4: The tumor is any size and has extended beyond the thyroid. T4a: The tumor has spread beyond the thyroid to nearby soft tissues, the larynx, trachea, esophagus, or recurrent laryngeal nerve. T4b: The tumor has spread beyond the regions in T4a (above). The “N” in the TNM staging system stands for lymph nodes. There are many regional lymph nodes located in the head and neck area. Careful assessment of lymph nodes is an important part of staging thyroid cancer. Lymph nodes in other parts of the body are called distant lymph nodes. N1: Cancer has spread to the lymph nodes. N1a: Cancer has spread to the lymph nodes around the thyroid (called the central compartment; the pretracheal, paratracheal, and prelaryngeal lymph nodes). N1b: Cancer has spread beyond the central compartment, including unilateral cervical (lymph nodes on 1 side of the neck), bilateral cervical (lymph nodes on both sides of the neck), contralateral cervical (the opposite side of the tumor), or mediastinal (the chest) lymph nodes. The “M” in the TNM system indicates whether cancer has spread to other parts of the body, called distant metastasis. Most thyroid cancers can be cured, especially if they have not spread to distant parts of the body. If the cancer can’t be cured, the goal of treatment may be to remove or destroy as much of the cancer as possible and to keep it from growing, spreading, or returning for as long as possible. Sometimes treatment is aimed at palliating (relieving) symptoms such as pain or problems with breathing and swallowing. In choosing a treatment plan, factors to consider include the type and stage of the cancer and your general health. Often, more than one type of treatment is needed. The type of treatment your doctor will recommend depends on type and stage of the cancer and on your overall health. This section discusses the typical treatment options for each type and stage of thyroid cancer, but your doctor may have reasons for suggesting a different treatment plan. Don’t hesitate to ask him or her questions about your treatment options. Most cancers are treated with removal of the thyroid (thyroidectomy), although small tumors that have not spread outside the thyroid gland may be treated by just removing the side of the thyroid containing the tumor (lobectomy). If lymph nodes are enlarged or show signs of cancer spread, they will be removed as well. 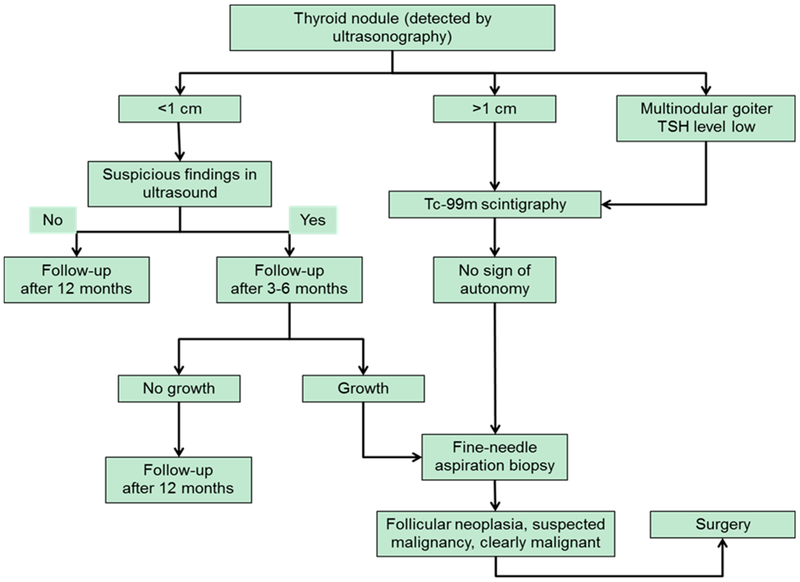 In addition, recent studies have suggested that patients with micro-papillary carcinomas (very small thyroid cancers) may safely choose to be managed by close observation with ongoing ultrasounds rather than have immediate surgery. Even if the lymph nodes aren’t enlarged, some doctors recommend central compartment neck dissection (surgical removal of lymph nodes next to the thyroid) along with removal of the thyroid. Although this operation has not been shown to improve cancer survival, it might lower the risk of cancer coming back in the neck area. Because removing the lymph nodes allows them to be checked for cancer under the microscope, this surgery also makes it easier to accurately stage the cancer. If cancer has spread to other neck lymph nodes, a modified radical neck dissection (a more extensive removal of lymph nodes from the neck) is often done. Treatment after surgery depends on the stage of the cancer. Radioactive iodine (RAI) treatment is sometimes used after thyroidectomy for early stage cancers (T1 or T2, N0, M0), but the cure rate with surgery alone is excellent. If the cancer does come back, radioiodine treatment can still be given. RAI therapy is often given for more advanced cancers such as T3 or T4 tumors, or cancers that have spread to lymph nodes or distant sites. The goal is to destroy any remaining thyroid tissue and to try to treat any cancer remaining in the body. Areas of distant spread that do not respond to RAI may need to be treated with external beam radiation therapy, targeted therapy, or chemotherapy. 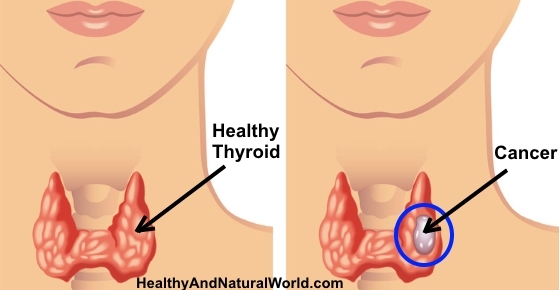 People who have had a thyroidectomy will need to take daily thyroid hormone (levothyroxine) pills. If RAI treatment is planned, the start of thyroid hormone therapy may be delayed until the treatment is finished (usually about 6 weeks after surgery). Recurrent cancer: Treatment of cancer that comes back after initial therapy depends mainly on where the cancer is, although other factors may be important as well. The recurrence may be found by either blood tests or imaging tests such as ultrasound or radioiodine scans. If cancer comes back in the neck, an ultrasound-guided biopsy is done first to confirm that it is really cancer. Then, if the tumor appears to be resectable (removable), surgery is often used. If the cancer shows up on a radioiodine scan (meaning the cells are taking up iodine), radioactive iodine (RAI) therapy may be used, either alone or with surgery. If the cancer does not show up on the radioiodine scan but is found by other imaging tests such as an MRI or PET scan, external radiation may be used. The target therapy drugs sorafenib (Nexavar) and lenvatinib (Lenvima) may be tried if the cancer has spread to several places and RAI and other treatments are not helpful, but doctors are still trying to find effective drugs for this disease. Because these cancers can be hard to treat, another option is taking part in a clinical trial of newer treatments. Often, it isn’t clear that a tumor is a follicular cancer based on a FNA biopsy. If the biopsy results are unclear, they might list “follicular neoplasm” as a diagnosis. Only about 2 of every 10 follicular neoplasms will actually turn out to be cancer, so the next step is usually surgery to remove the half of the thyroid gland that has the tumor (a lobectomy). If the tumor turns out to be a follicular cancer, a second operation to remove the rest of the thyroid is usually needed (this is called a completion thyroidectomy). If the patient is only willing to have one operation, the doctor may just remove the whole thyroid gland in the first place. Still, for most patients, this isn’t really needed. If there are signs the cancer has spread before surgery, the tumor must be a cancer and so a thyroidectomy will be done. Hürthle (Hurthle) cell carcinoma can also be hard to diagnose with certainty based on a FNA biopsy. Tumors suspected of being Hürthle cell carcinomas are often treated like follicular neoplasms. A lobectomy is usually done first. If the diagnosis is confirmed, a completion thyroidectomy is done. A thyroidectomy may be done as the first surgery if there are signs the cancer has spread or if the patient requests it to keep from having more surgery later. As with papillary cancer, some lymph nodes usually are removed and examined. If cancer has spread to lymph nodes, a central compartment or modified neck dissection (surgical removal of lymph nodes from the neck) may be done. Because the thyroid is removed, patients will need to take thyroid hormone therapy as well, although it is often not started right away. Radioiodine scanning is usually done after surgery to look for areas still taking up iodine. Spread to nearby lymph nodes and to distant sites that shows up on the scan can be treated by radioactive iodine (RAI). For cancers that don’t take up iodine, external beam radiation therapy may help treat the tumor or prevent it from growing back in the neck. Distant metastases may need to be treated with external beam radiation therapy, or target therapy with sorafenib (Nexavar) or lenvatinib (Lenvima) if they do not respond to RAI. Another option is taking part in a clinical trial of newer treatments or chemotherapy. If cancer comes back in the neck, an ultrasound-guided biopsy is first done to confirm that it is really cancer. Then, if the tumor appears to be resectable (removable), surgery is often used. If the cancer shows up on a radioiodine scan (meaning the cells are taking up iodine), radioactive iodine (RAI) therapy may be used, either alone or with surgery. If the cancer does not show up on the radioiodine scan but is found by other imaging tests such as an MRI or PET scan, external radiation may be used. Targeted therapy with sorafenib (Nexavar) and lenvatinib (Lenvima) is tried first if the cancer has spread to several places and RAI was not helpful. Because these cancers can be hard to treat, another option is taking part in a clinical trial of newer treatments. If a clinical trial is not available your doctor may recommend chemotherapy. Most doctors advise that patients diagnosed with medullary thyroid carcinoma (MTC) be tested for other tumors that are typically seen in patients with the MEN 2 syndromes, such as pheochromocytoma and parathyroid tumors. Screening for pheochromocytoma is particularly important, since the unknown presence of this tumor can make anesthesia and surgery extremely dangerous. If surgeons and anesthesiologists know about such tumors ahead of time, they can treat the patient with medicines before and during surgery to make surgery safe. Stages I and II: Total thyroidectomy is the main treatment for MTC and often cures patients with stage I or stage II MTC. Nearby lymph nodes are usually removed as well (central compartment or modified radical neck dissection). Because the thyroid gland is removed, thyroid hormone therapy is needed after surgery. For MTC, thyroid hormone therapy is meant to provide enough hormone to keep the patient healthy, but it does not reduce the risk that the cancer will come back. Because MTC cells do not take up radioactive iodine, there is no role for radioactive iodine therapy in treating MTC. Still, some doctors give a dose of radioactive iodine to destroy any remaining normal thyroid tissue. If MTC cells are in or near the thyroid, this may affect them as well. Stages III and IV: Surgery is the same as for stages I and II (usually after screening for MEN 2 syndrome and pheochromocytoma). Thyroid hormone therapy is given afterward. When the tumor is extensive and invades many nearby tissues or cannot be completely removed, external beam radiation therapy may be given after surgery to try to reduce the chance of recurrence in the neck. For cancers that have spread to distant parts of the body, surgery, radiation therapy, or similar treatments may be used if possible. If these treatments can’t be used, vandetanib (Caprelsa), cabozantinib (Cometriq), or other targeted drugs may be tried. Chemotherapy may be another option. Because these cancers can be hard to treat, another option is taking part in a clinical trial of newer treatments. Recurrent cancer: If the cancer recurs in the neck or elsewhere, surgery, external radiation therapy, targeted therapy (such as vandetanib or cabozantinib), or chemotherapy may be needed. Clinical trials of new treatments may be another option if standard treatments aren’t effective. Genetic testing in medullary thyroid cancer: If you are told that you have MTC, even if you are the first one in the family to be diagnosed with this disease, ask your doctor about genetic counseling and testing. Genetic testing can find mutations in the RET gene, which is seen in cases of familial MTC and the MEN 2 syndromes. If you have one of these mutations, it’s important that close family members (children, brothers, sisters, and parents) be tested as well. Because almost all children and adults with mutations in this gene will develop MTC at some time, most doctors agree anyone who has a RET gene mutation should have their thyroid removed to prevent MTC soon after getting the test results. This includes children, since some hereditary forms of MTC affect children and pre-teens. Total thyroidectomy can prevent this cancer in people with RET mutations who have not yet developed it. Of course, this means that lifelong thyroid hormone replacement will be needed. Because this cancer is already widespread when it is diagnosed, surgery is often not helpful as treatment. If the cancer is confined to the area around the thyroid, which is rare, the entire thyroid and nearby lymph nodes may be removed. The goal of surgery is to remove as much cancer in the neck area as possible, ideally leaving no cancer tissue behind. Because of the way anaplastic carcinoma spreads, this is often difficult or impossible. Radioactive iodine treatment does not work in this cancer and so is not used. If the cancer is causing (or may eventually cause) trouble breathing, a hole may be placed surgically in the front of the neck and into the windpipe to bypass the tumor and allow the patient to breathe more comfortably. This hole is called a tracheostomy. For cancers that have spread, chemotherapy can be used, sometimes along with radiation therapy if the cancer is not too widespread. If the cancer cells have certain changes in the BRAF gene, treatment with the targeted drugs dabrafenib (Tafinlar) and trametinib (Mekinist) is another option. Because these cancers can be hard to treat, clinical trials of newer treatments are an option as well. Most early thyroid cancers are found when patients see their doctors because of neck lumps or nodules they noticed. If you have unusual symptoms such as a lump or swelling in your neck, you should see your doctor right away. Other cancers are found by health care professionals during a routine checkup. There is no recommended screening test to find thyroid cancer early. Some doctors also recommend that people examine their necks twice a year to look and feel for any growths or lumps. Early thyroid cancers are also sometimes found when people have ultrasound tests for other health problems, such as narrowing of carotid arteries (which pass through the neck to supply blood to the brain) or for enlarged or overactive parathyroid glands. Blood tests or thyroid ultrasound can often find changes in the thyroid, but these tests are not recommended as screening tests for thyroid cancer unless a person is at increased risk, such as because of a family history of thyroid cancer. People with a family history of medullary thyroid cancer (MTC), with or without type 2 multiple endocrine neoplasia (MEN 2), might have a very high risk for developing this cancer. Most doctors recommend genetic testing for these people when they are young to see if they carry the gene changes linked to MTC. For those who may be at risk but don’t get genetic testing, blood tests can help find MTC at an early stage, when it may still be curable. Thyroid ultrasounds may also be done in high-risk people. Younger people have a low likelihood of dying from differentiated (papillary or follicular) thyroid cancer. The TNM stage groupings for these cancers take this fact into account. So, all people younger than 55 years with these cancers are stage I if they have no distant spread and stage II if they have distant spread. This table includes patients 55 or older as well as younger than 55. The cancer is any size (Any T) and might or might not have spread to nearby lymph nodes (Any N). The cancer is no larger than 2 cm [0.8 inches] across and confined to the thyroid (T1). The cancer is larger than 2 cm [0.8 inches] across but no larger than 4 cm and confined to the thyroid (T2). The cancer can be any size (Any T). It might or might not have spread to nearby lymph nodes (Any N). It has spread to other parts of the body, such as distant lymph nodes, internal organs, bones, etc. (M1). It has spread to nearby lymph nodes (N1). It has not spread to distant sites (M0). The cancer is larger than 4 cm but confined to the thyroid (T3a) or it has grown into the strap muscles around the thyroid (T3b). The cancer is any size and has grown extensively beyond the thyroid gland into nearby tissues of the neck, such as the larynx (voice box), trachea (windpipe), esophagus (tube connecting the throat to the stomach), or the nerve to the larynx (T4a). The cancer is any size and has grown extensively beyond the thyroid gland back toward the spine or into nearby large blood vessels (T4b). All anaplastic thyroid cancers are considered stage IV, reflecting the poor prognosis for people with this type of cancer. The cancer is any size but confined to the thyroid (T1, T2, or T3a). The cancer is any size but confined to the thyroid (T1, T2, or T3a). It has spread to nearby lymph nodes (N1). The cancer is any size and has grown into the strap muscles around the thyroid (T3b). The cancer is any size and has grown extensively beyond the thyroid gland into nearby tissues of the neck, such as the larynx (voice box), trachea (windpipe), esophagus (tube connecting the throat to the stomach), or the nerve to the larynx or back toward the spine or into nearby large blood vessels (T4). Age is not a factor in the stage of medullary thyroid cancer. The cancer is 2cm (0.8 inches) or smaller and confined to the thyroid (T1). The cancer is larger than 2cm but no more than 4cm across and confined to the thyroid (T2). The cancer is larger than 4cm and confined the thyroid or any size and growing outside of the thyroid but not involving nearby structures (T3). The cancer is any size and might be growing outside of the thyroid but not involving nearby structures (T1, T2, T3). It has spread to lymph nodes in the neck (pretracheal, paratracheal, prelaryngeal, or upper mediastinal) (N1a) but not to other lymph nodes or to distant sites (M0). The cancer is any size and has grown beyond the thyroid gland into nearby tissues of the neck, such as the larynx (voice box), trachea (windpipe), esophagus (tube connecting the throat to the stomach), or the nerve to the larynx (T4a). It has spread to certain lymph nodes in the neck such as cervical or jugular nodes (N1b). It has not spread to distant sites (M0). The cancer is any size and has grown either back toward the spine or into nearby large blood vessels (T4b). The cancer is any size and might have grown into nearby structures (Any T). It might or might not have spread to nearby lymph nodes (Any N). It has spread to distant sites such as the liver, lung, bone or brain (M1).